A distant member of the apple family, the pear has been found to be a great source for many vitamins as well as dietary fiber. Most of the vitamins are contained in the skin of the fruit, so it is important to not peel the fruit. Pears are a delicious healthy way to keep the body regulated. Pears are high in fiber. 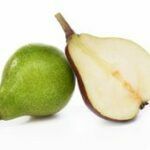 In a medium-sized pear, there are about six grams of fiber (20%-24% of daily requirement). A diet high in fiber can prevent colon cancer as well as keep cholesterol levels down. There is also a link between a normal fiber diet and a lower risk for breast cancer. Pectin, a water soluble fiber is also used as a diuretic and has a mild laxative effect. Drinking pear juice will regulate bowel movements. Pears also contain Vitamin C and Vitamin E, which are powerful antioxidants and essential nutrients. Antioxidants prevent high blood pressure and strokes and are critical in building the immune system. In conjunction with Vitamin C, the copper content of the pair act as antioxidants that protect cells from free radicals. If free radicals are not removed, they could promote the production of cancer cells. Another antioxidant found in pears is Quercetin. This antioxidant prevents cancer and artery damage that can lead to heart problems. In a recent study at Cornell University, Quercetin was found to protect against Alzheimer’s disease. High levels of boron is also found in pears. Our bodies use boron to retain calcium which will help prevent or delays osteoporosis. Pregnant women should include pears in their diet. The high content of folic acid will prevent neural tube defects in infants. Other beneficial factors of pears include an anti-inflammatory effect, a natural source of energy from the high amounts of glucose and fructose, a cooling effect which will relieve fevers, a reduction of phlegm in the throat as well as nourishes and soothes the throat. Also, eating three or more servings of fruits a day, such as pears, may also lower your risk of age-related macular degeneration (ARMD), the primary cause of vision loss in older adults. There are no health hazards of side effects known. Pears are hypo-allergenic fruit so those with food sensitivities can usually eat pears with no adverse effects. “Pear” purematters, 2012. Web. 28 May 2013.